Looking for the best indoor rabbit cage? It doesn’t matter if you’re a new rabbit owner or an experienced one, having the best indoor rabbit cage is important to the whole experience. Choosing to house your rabbit indoors is a smart idea considering that a rabbit can have a heart attack at the sight of a predator. Not only do the predators prey on these small creatures, but rabbits need human interaction and playtime that they might not get while living outdoors. 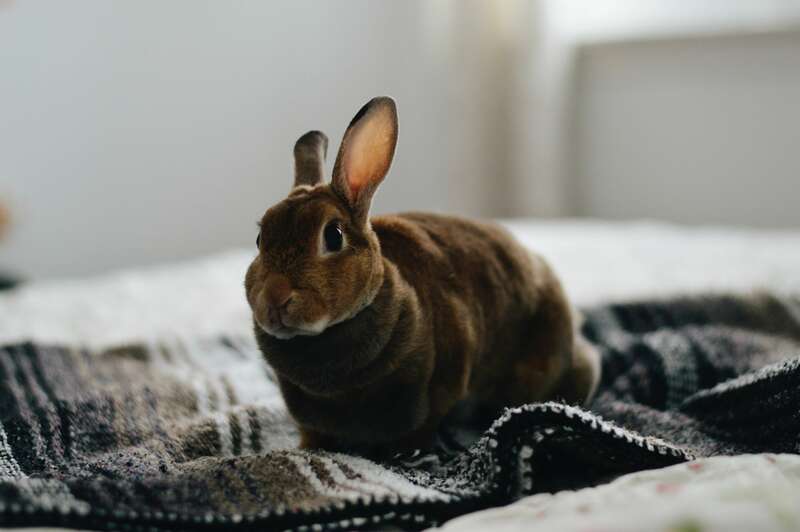 If you’re a new bunny parent then you might have never thought about a rabbit living on the inside, but with the proper training and enough space to roam, you will be surprised at how happy your little fur baby will be living indoors with you. Since this might be a new experience for you, knowing what you need and how to keep your pet happy might be questionable. Don’t worry, that’s what we’re here for. Continue reading as we have created a guide that will walk you through everything you will need to get started; from getting to know your new bunny to how to choose the best indoor rabbit cage to keep him happy and secure. Believe it or not, you can train your bunny in some of the same ways as you would your dog or cat. A bunny can be litter trained like a cat and he can learn tricks like a dog. You must keep in mind though that a bunny is a chewer, so much like a new puppy, your bunny will chew his toys and he can even chew his way out of his cage if it’s not bunny proof. Rabbits tend to be timid and will be frightened easily, that’s why it’s a good idea to keep him inside with you. Think about how you would feel if you were tiny and defenseless, you would be scared too, so keep him safe by keeping him inside. Keep in mind that they feel secure with their feet touching the ground, so your bunny might not enjoy being picked up, but sit down and you can bet he will hop in your lap or he might make a seat quietly next to you. Unlike a cat or a dog, your bunny won’t be noisy, but he will be sure to grunt when he wants some attention. He will enjoy a tasty treat and he will greet the people he knows with a lick of his soft silky tongue. That sounds just like a dog or a cat doesn’t it? Speaking of dogs and cats, your new bunny might be afraid of your other house pets so don’t abruptly push them together and expect them to be friends right away. Give them time to warm up to one another and you just might find them to be best friends until the end. One important factor to note about your new little pal is that he will be the most active in the morning and in the evening, so that would be the best time to give him a chance to exercise and play. He will let you know when he doesn’t want to be bothered when he goes into his quiet space to hibernate for a while. When choosing your indoor rabbit cage keep in mind that your rabbit will need room to play and exercise at least once or twice a day. Some people allow their bunnies free roam of the house leaving the door to their cage open all the time, but this might not be a good idea unless your bunny will guarantee not to spray his territory or chew through the couch. Choose a Strong Floor– Since a rabbit is a chewer and digger by nature, it’s important you choose a floor that is made of hard plastic, resin, or fiberglass so that he can’t escape through the bottom. Avoid choosing a wire floor because your bunny won’t feel as secure walking or standing on the floor, plus he might be able to chew his way out. Choose a Deep Pan– If it’s possible, choose a cage with a deep pan on the bottom. This will keep your bunny mess inside his house and not on the floor of yours. If the pan is shallow, not only will he have the ability to kick his mess onto your floor, but he might also spray on your walls. Size Matters– The size of the cage should be four times longer than your bunny and two times wider than he is. This is only counting his main living space and doesn’t include his additional play area. He will need separate areas for feeding, potty, and sleep. Easy Access– Try to choose a cage that not only offers a front access door but also a top access door. With a top door, you will have better access to feeding and petting your bunny. If it only provides one door then you will want a front door accessible cage. Ladders and Ramps– Rabbits often feel intimidated by those ramps that are often included with the cages. Try to find a ramp with built-in-stairs or a ladder so that your bunny will feel more secure in his home. Furnishings- Your bunny will need a food bowl that is usually kept on an elevated portion of the cage. He will need a hay feeder because the biggest portion of your rabbits diet will consist of hay, and of course, he will need a water bottle that is always full. He will need a litter box that should be placed in a spot of its own and a dark, quiet spot where he can enjoy a nap. Remember, this is his main living quarters, he will also need a larger place to play. Playpen- His play area should be separate from his main living space. There are extensions that can be added to some cages or you can choose a playpen area much as you would use for a child or even a dog. Your bunny will enjoy playing with sticks, boxes of all sizes, jingle balls like your cat would play with, stuffed animals, and even a rope. The more toys they have, the less they will chew things they shouldn’t. If you don’t have a cage with an additional play area you must furnish a separate place for him to hop and play once or twice a day. Now that your anxiety is pumping and you’re ready to bring home your new bunny let’s choose the right home for him. This is our favorite single-story rabbit cage on the list. It offers more space than your adult rabbit will need, and it could easily house two rabbits, of course, you will want to be sure they are spayed and neutered before putting them together. This is an extremely durable cage and it is chew proof, so you can be sure your bunny won’t escape. It offers plenty of ventilation and view so that you and your furry pal can always see each other. The pan is large enough to keep everything in his home and not yours, and it has an elevated food tray with a quiet space beneath it for him to hide-a-way and snooze. 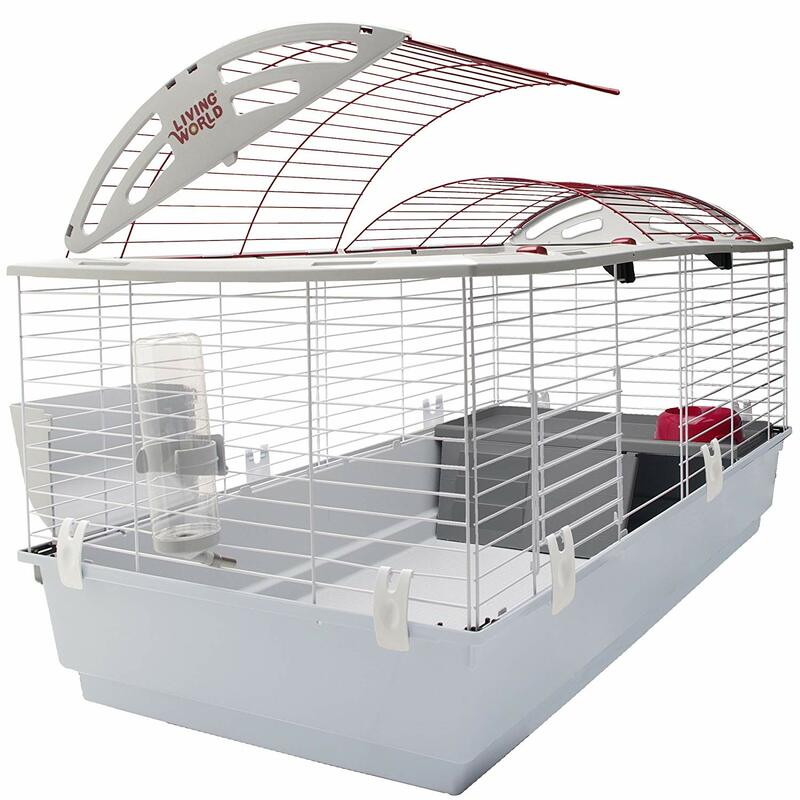 This cage features a large door on the top for you to quickly and easily feed and pet your bunny and you can open the door on the front of the cage for him to come and go as he pleases. Not only will you be happy with this cage, but you will also be thrilled with the built-in-stairs on the balcony, the food dish that is designed to stay in place, a water bottle, and a hay feeder. These are all necessities that you will need, so consider it a bonus when you find these things included with your purchase. If the extra large is a bit bigger than you are looking for, this one is also offered in a large or standard size. You will find the price is exactly where it should be for the quality of this habitat and all that is included. This bunny cage is versatile, offering several options for setting it up. It is spacious and will give your little pal more than eight-square feet of living space. This spacious habitat provides plenty of room for your bunny to eat and sleep, you can even give him a special spot in the corner for his potty business. 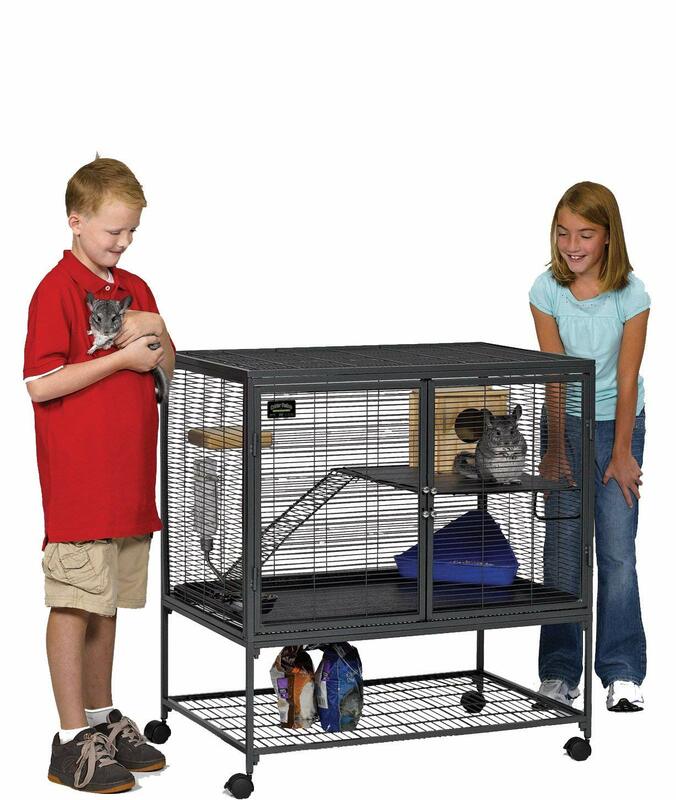 It features a large opening in the front that extends the length of the cage, so you can easily feed him, pet him, and clean him. The wooden extension provides a separate top opening for you to easily get him in and out when needed. 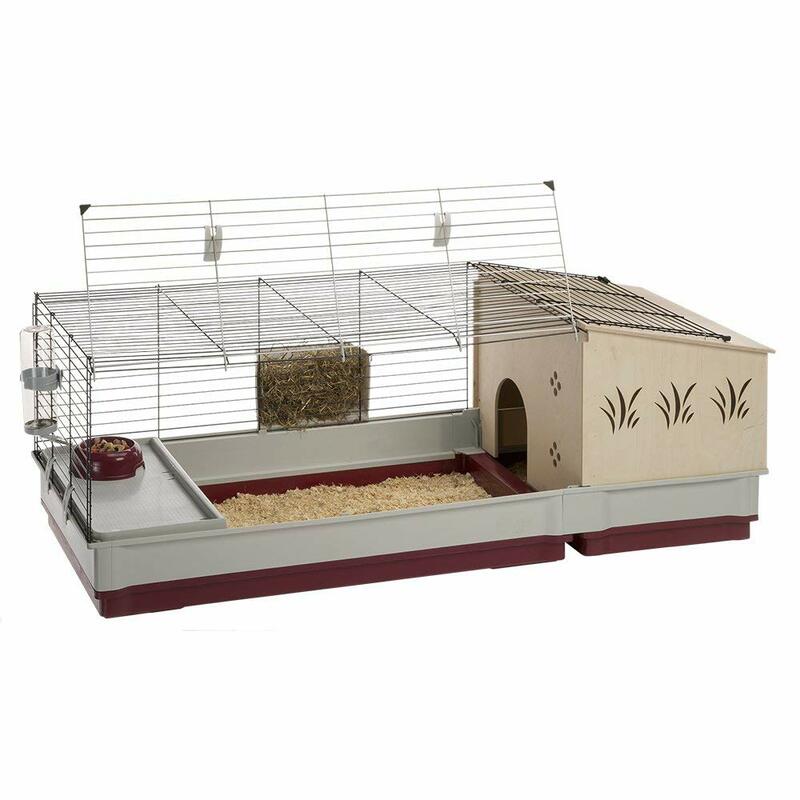 It comes with a wooden extension for him to have a private napping place and you can connect it to either end of the cage. The floor is a durable plastic and the pan is six-inches deep, so unless you have an extremely messy bunny, there should be no reason he can’t keep his mess on the inside of his cage. The included water bottle will conveniently hook to the side of the cage alongside the hay feeder. It also comes with an elevated food shelf that you can use or you can leave it out, giving your furball more room to roam. You might find that the wooden house will absorb odors faster than the rest of the cage, so you might have the need to clean it a bit more often than you expect. This indoor rabbit cage comes with everything including the addition giving you all you will need to get started. You will need additional roaming space for your little pal to play. The price tag attached to this cage is acceptable to most budgets and the rating is higher than most. If you’re on a budget but you’re looking for the best indoor rabbit cage with everything you need, this one is our best choice in that category. This one is simple with the option to add an extension later, yet it features all the great necessities your bunny will need. The front provides a double door giving you the option of opening one at a time or both for easy access to your pet. The floor is made of a hard plastic to assure your little chewer will stay in the cage and the elevated food tray not only allows your bunny a place to lounge at the top, but he can also sneak underneath for a quiet nap. 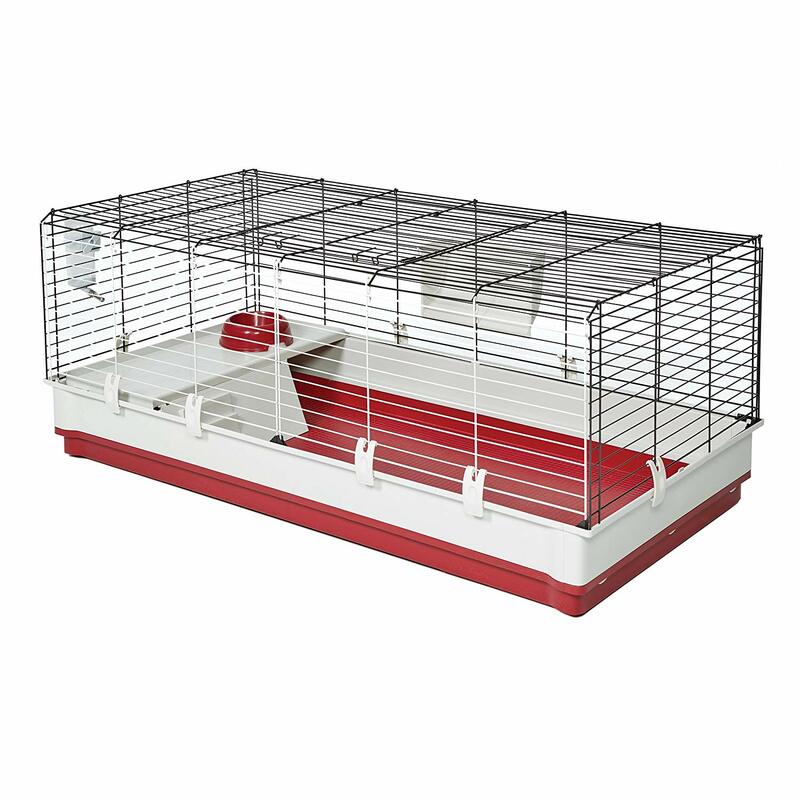 It is a large enough cage to house two rabbits and you also have the option of adding a wooden extension in the future. It comes with a deep pan, a food bowl, water bottle, and hay feeder. All this is offered at an affordable price plus you can add to it later, you can’t ask for a better deal than this one! When it comes to a two-story rabbit cage, this one is our top pick. The ramp is less intimidating for a rabbit, it’s space saving, and it’s spacious enough for two bunnies. This two-story habitat provides a deep pan attached to a durable floor made of plastic so that your inquisitive rabbit won’t chew his way through the bottom. The unique door slides to the side so that you can keep this cage in small places without the door getting in the way, except you might consider adding security to the door because it might not be as bunny proof as the others. The ramp to the loft is different from the rest because it is wooden and replicates a ladder that one would use to access an attic in a house. In the loft, you will find additional space for your bunny to relax and the elevated food tray allows your pal to enjoy a meal. There is plenty of room on the main floor for toys and a potty area. 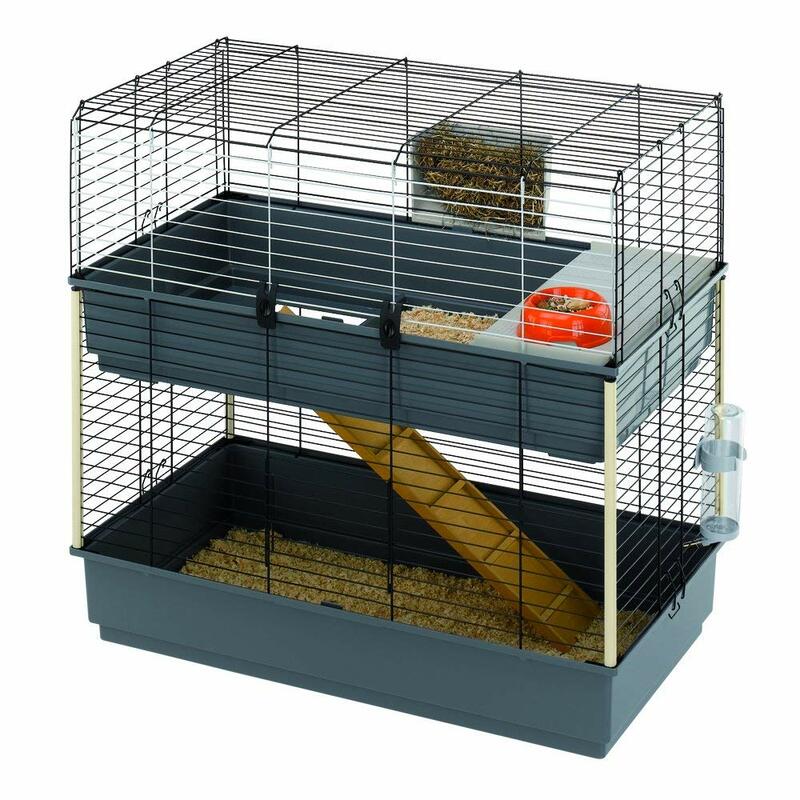 Besides the ladder and elevated food tray, this cage also includes a food bowl, a water bottle, and a hay feeder. You can easily add this to a larger playpen area where your fur baby can hop and play. For a larger two-story bunny cage, this one is a good choice. It’s spacious, can house more than one rabbit, and you can easily maneuver it with the casters attached to the stand. For more than one rabbit, this cage will perfectly suit your needs. With two stories, your fur balls will have plenty of room to roam and play, but that doesn’t mean they won’t need additional space outside the crate for play time. Although the pan in this one is shallow and may not keep everything inside the cage, it is a plastic one, so they’re feet will be happy, and they won’t chew their way out. The ladder to the adjustable loft is less intimidating, but if you have a bunny who has a problem with stairs, it does come with a cover to make it a ramp. The first floor is large enough for a spacious litter box and you can add a quiet place for nap time. The double doors on the front make it easy to access your pet, and cleaning couldn’t be easier. The cage sits conveniently on a stand and the wheels attached are easy to move it around the room. There is an additional shelf on the bottom of the stand for storing food and other bunny necessities. With all this convenience you couldn’t ask for anything more. Now that you have this list of everything you need for finding the best indoor rabbit cage you should be on your way to the bunny patch!